Today we have a special treat for all of you Wii U™ owners. Yes, both of you! 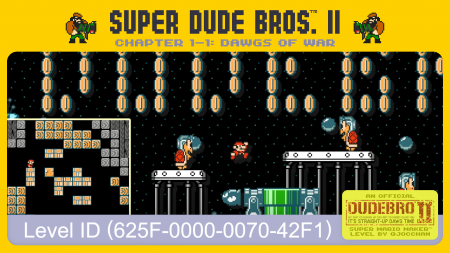 Super Dude Bros.™ II Chapter 1-1: Dawgs of War, the first and hopefully not last official Dudebro™ II level for the recently released Super Mario Maker™, is now available to download and play*. This level is reachable through the following ID: (625F-0000-0070-42F1). It is the year 2015. Supah Mariobro, a heroic plumber from B.R.O. Alliance, embarks on a grand adventure to rescue his beloved Brincess Beach from the greedy paws of the KooPro professional terrorist organization. Will he triumph, or will his addiction to mushrooms spell his doom? Will he find the three 1up mushrooms hidden across the land? Will he beat his high score? There is only one answer to these questions: it’s all up to you! For gameplay footage, click here. *) To play this level you need access to a copy of Super Mario Maker™, an Internet connection, and, well, a Wii U™. This entry was posted on Saturday, September 26th, 2015 at 1:00 pm	and is filed under Main News.